Vintage MG Parts are able to offer perfect reproduction P/N Type brown mixture control and slow running knobs which are sold as a pair. Complete with brass threaded insert. 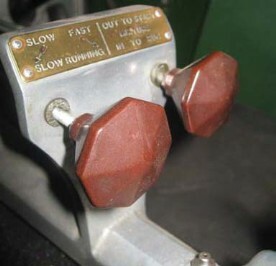 The original factory gear lever knobs were produced in a marginally different material to the original control knobs (see photo above of original knobs) and therefore, ended up having a colour mismatch. We have uniformed the colour so that these knobs match our brown octagonal gear knob. We have chosen to produce the rods in highly polished imperial size stainless steel. We also stock the knurled chrome knobs and rods for F, J and L Types.